Take It In Right (early studio version). Can You Hear Me (live, 1974). Can You Hear Me (with Cher, broadcast, 1975). Bowie likely wrote “Can You Hear Me,” originally called “Take It In Right,” in late 1973 and he cut a studio demo of it on New Year’s Day 1974 (when he also taped “Alternative Candidate”). A few months later he tried the song out in New York as a possible single for Lulu. While nothing was released from the Lulu session, it did bear fruit: there Bowie first met the guitarist Carlos Alomar, who Bowie recruited for his next album. In August ’74, Alomar came to Philadelphia’s Sigma Sound studios with his wife Robin Clark and their friend, a 23-year-old aspiring singer and songwriter named Luther Vandross. Before long, Clark and Vandross, who had come only to give “moral support” to Alomar, were drafted as singers, with Vandross soon becoming Bowie’s de facto singing coach and vocal arranger for the sessions. And Bowie’s vocal here seems like a long battle. He first sings the title phrase, which starts the chorus, fairly low in his range, and when he finally goes up with four ascending notes on the first “take it in right” he drops down a half-octave two beats later. There’s his odd nasal phrasing in the second verse (“there’s been so many others,” where Bowie makes a rhyme out of thurrs and othurrs), his shaky falsetto in the later verses. On further repeats of “take it in right” Bowie again seems to struggle, falling back as soon as he reaches a new peak. Only the last chorus repeat of “take it in right” has a sense of release, as if Bowie’s willed himself to break through. The song ends with a 20-bar outro in which Bowie and the chorus trade lines: they’re finally left standing alone, singing the last seconds of the song a cappella. The arrangement seems inspired by the Kenneth Gamble/Leon Huff and Thom Bell productions for Philadelphia International Records, which Bowie was listening to incessantly during the Young Americans period. Bell in particular would clad soul songs in pristine, elaborate arrangements—Bell often would keep the strings or horns off-stage until the chorus, then drape them over the vocals, or he’d place unusual-sounding instruments high in the mix (like the sitar and French horn on the Delfonics’ “Didn’t I (Blow Your Mind This Time)” or the eerie marimba of the Stylistics’ “People Make the World Go Round”). “Take It In Right” was cut on 1 January 1974 while the Lulu version, from April ’74, remains unreleased—the bootleggers haven’t unearthed it yet. “Can You Hear Me” was cut ca. 8-18 August 1974 at Sigma Sound in Philadelphia (an earlier studio take, minus strings, is on bootlegs like Absolutely Rare), and was on the second side of Young Americans. Performed during the subsequent Philly Dogs tour, while the Cher duet, from Cher, filmed on 23 November 1975, marks the song’s final appearance to date. 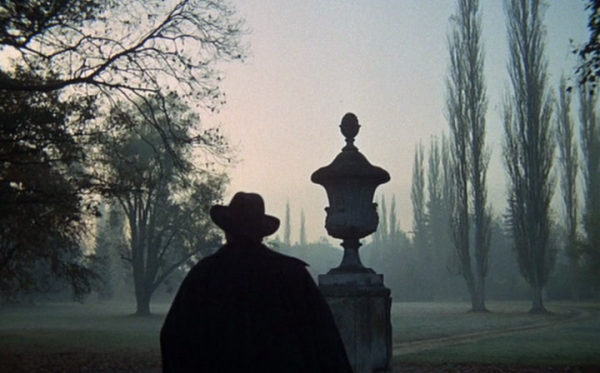 Top: Orson Welles, F For Fake, 1974.